This reference design from TI demonstrates the LM46002 SIMPLE SWITCHER® Synchronous Buck Converter and the LMZ21701 SIMPLE SWITCHER® Nano Module. The LM46002 provides a regulated 12V rail from an input of 15V to 60V. 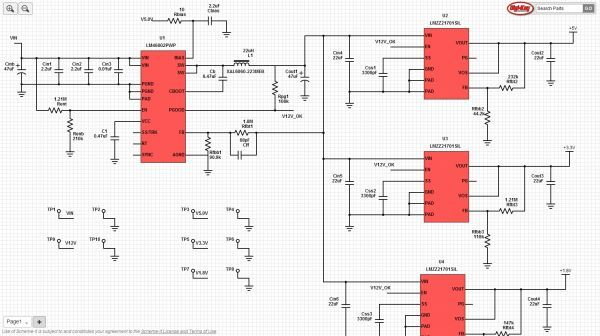 The 12V rail is then regulated down to 5V, 3.3V, and 1.8V rails using three LMZ21701 nano modules. Each rail can provide up to 1A of load current. This modules’ wide input voltage capability and small solution size, ease of use, high efficiency and modular design was seen at APEC.